This review has not yet been approved by the owner of this writing service. If you are the webmaster of Academicessaywritingservice.com, please Contact Us to approve or remove this review. To call the website minimalistic would be an understatement – it consists of just four pages with some flashy graphics strewn over. A main page, price chart, order form, a link to the payment site and a contact form. There is no FAQ, no terms and conditions, almost no information on the service proper. It is good enough that they got around to including pricing page into their view of the world, but they specifically note that the prices they show are approximate ones and your order may cost differently based on the factors they do not divulge. When it comes to prices, what AcademicEssayWritingService.com offers cannot be described in any way but average: not particularly high and not exceedingly cheap either. The price range isn’t very broad as well: essays start at about $16.49/page for High School assignments due in two weeks and rise to mere $35.49/page for Master’s level to be written within 12 hours. It is a much less dramatic rise than in many other academic writing services, where the prices may grow by an order of magnitude from the cheapest to the most expensive. For a service that doesn’t bother to describe its work in detail on their website it would have been only natural (or at least, logical) to try and compensate for their non-informative website by means of customer support. This is not the case here – there are only two closely connected ways to contact support: via e-mail and via query form that addresses your question to the same e-mail. Yes, they tend to answer rather quickly, but the answers themselves leave much to be desired – they are short, superficial and not always to a point. Time and again I had to write to them and repeat my question that was misunderstood or simply ignored. I had no way to evaluate the quality of writing offered by this site. As they don’t consider it necessary to place assignment samples on their website, it is impossible to make even an approximate estimation. The writer is appointed by the service, you have no say in this matter. 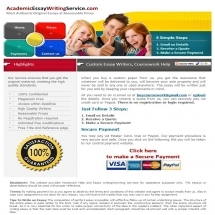 Judging by its design and unhelpfulness, it is not a very good decision to deal with AcademicEssayWritingService.com. Credits instead of refunds? What a peculiar idea. If I am dissatisfied with the service, I want my money back. I am certainly not eager to order anything from the same agency in future.